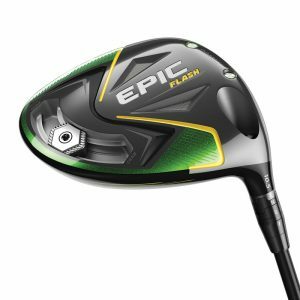 Callaway Epic Flash Drivers Embrace A.I. Callaway Golf CEO Chip Brewer’s job is to be bullish on his company’s products, but Brewer is more animated than usual when it comes to the new Epic Flash driver, which went on sale in retail shops Feb. 1. The Epic Flash driver’s two models — Standard and Sub Zero — each feature what Callaway calls “Flash Face’’ technology that is created by artificial Intelligence and “machine learning,” a field of computer science that uses statistical techniques to give computer systems the ability to “learn” with data without being explicitly programmed. A new driver face design typically takes eight to ten iterations. Through Machine Learning, the company says its computers cycled through 15,000 face architecture iterations, learning from each one, before arriving at Flash Face. Flash Face’s unique, internal mapping consists of dozens of subtle ripples flowing from heel to toe. Though the size, height and configuration of the ripples appears random, they in fact work together cohesively to elevate COR in the face’s center region. That convention-defying accomplishment results in a significant ball speed boost for a noticeable distance increase with solid contact, helping drives go even longer. The Epic Flash driver also incorporates Jailbreak technology that promotes fast, face- wide speed. The two internal, hourglass-shaped Jailbreak bars connect the crown to the sole, stabilizing and stiffening those two parts at impact, allowing the face to take on greater impact load to generate faster ball speed. Together, Flash Face and Jailbreak make the Epic Flash one of the most innovative and technologically advanced drivers in Callaway history. The Epic Flash driver was introduced this past January and fit into Callaway’s regular product introduction cycle. But Brewer hinted that the company might vary from its – and the golf industry’s – traditional introduction cycles moving forward. Consumers have a choice of three premium stock shaft options: Project X EvenFlow, Project X HZRDUS Smoke and Mitsubishi Tensei AV. Stock grip is Golf Pride’s premium Tour Velvet Align. www.callawaygolf.com | Check the price on Amazon!